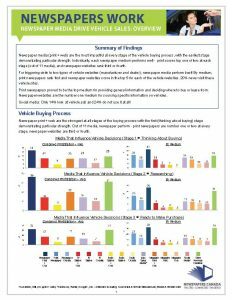 Newspapers Canada is pleased to release this research demonstrating the power of automotive advertising in newspapers in print and online. This two-page summary provides a quick overview of the key research findings and includes a variety of charts on the data. This PDF can be printed, emailed or key facts can be gleaned from it for use. 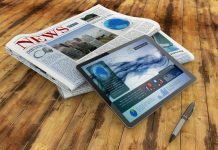 Newspaper media (print + web) are the most impactful at every stage of the vehicle buying process, with the earliest stage demonstrating particular strength. Individually, each newspaper medium performs well - print scores top one of two at each stage (out of 11 media), and newspaper websites rank third or fourth. For triggering visits to two types of vehicle websites (manufacturer and dealer), newspaper media perform best! By medium, print newspapers rank first and newspaper websites score in the top 5 for each of the vehicle websites. 20% never visit these vehicle sites. 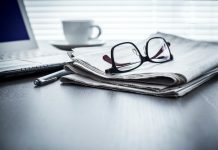 Print newspapers proved to be the top medium for providing general information and deciding where to buy or lease from. Newspaper websites are the number one medium for sourcing specific information on vehicles.